Just in time for the Holiday’s, from Lionsgate and Hit Entertainment comes Thomas & Friends: Adventure on the Tracks 6 DVD Set and Rescue on The Rails! All aboard for a very special holiday delivery with Thomas & Friends™: Adventure on the Tracks 6-DVD Set now available. Fans everywhere will enjoy 36 of their favorite episodes with Thomas and his engine friends as they find adventures, help friends and discover new things on the Island of Sodor. 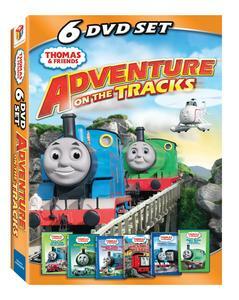 Filled with surprises around every bend, this very special 6-DVD collection is only $29.98 and is a perfect gift for any Thomas collector! Discover laughs and surprises around every bend! Thomas thinks he’s seen a ghost, Percy puffs into a giant pile of hay, Oliver encounters some troublesome trucks and Donald and Douglas rescue a mischievous engine. Always expect the unexpected on the Island of Sodor! Thomas gets a surprising push from a jet engine, Percy lets his imagination run away with him, Harold makes a horse fly and Salty and Fergus prove they’re useful on and off the tracks. Learn the importance of listening to others when Thomas ignores Percy’s wobbly track warning, Rusty sets off to save a reckless Duncan and Fergus proves himself to be really useful. Find out how just how much the Steamies and Diesels have in common when they put aside their differences and start working together to keep Sir Topham Hatt’s railway running smoothly. Come aboard for edge-of-your-seat-excitement as Thomas and his new fire engine friend, Flynn, race to the rescue on the Island of Sodor in the all-new Thomas & Friends: Rescue on the Rails now available from Lionsgate and HIT Entertainment. Enjoy new adventures with Thomas and his engine friends in four heroic tales featuring stunning CG animation and never-before-seen content! Thomas & Friends continues to teach timeless life lessons such as discovery, friendship and cooperation, inviting children to enter a world of imagination through the tracks of a train and the words of a story. Marci’s Top Ten SWEET Christmas Gifts With Recipes!